Sirwill FBM Tools - SPC/EPC/Six Sigma module (Version 7.2 for Windows XP and later editions) Get the best value for money ! Why you need this software ? There is a pressing need for the continual improvement of manufacturing and service processes in today�s competitive business environment. You may follow the time-tested Six Sigma DMAIC approach (define, measure, analyse, improve, and, control) in any improvement initiative. Collect the relevant data and analyse them using the SPC tools such as Cause and Effect Diagram, Pareto, Histogram, Scatter Plot, Control Chart, etc. Install an on-going control scheme (such as SPC chart or EPC chart) to sustain the improvement. SPC: Statistical Process control (SPC) is a scientific and inexpensive way to prevent defects. It is an effective check against assignable causes of process variation. You would require SPC tools for every Six Sigma project. EPC: Once a process is brought to stable condition using SPC charts, Engineering Process Control (EPC) helps in predicting the process performance and pro-active adjustments, thereby reducing process variability. It adds extra power to your process control schemes. Both SPC and EPC are very essential for achieving the PPM (parts per million) defect levels expected of your Six Sigma initiatives. In this context, it is very important to provide a statistical software to your personnel for error-free data analysis and charting on regular basis. 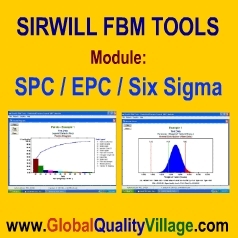 Our FBM Tools � SPC/EPC/Six Sigma module is a Windows-based computer program designed specifically for improvement projects, by seasoned Engineer-Statistician experts (alumni of the Indian Statistical Institute). Let�s take a look at the software features. Provision for SPC / EPC / Six Sigma training (in Kerala) & e-Consultancy at extra cost. The current version (i.e., Ver. 7.2) of this software comes in two forms, namely, LITE Edition and STANDARD Edition to suit the varying requirements of prospective buyers. We highly recommend STANDARD edition for corporate users, and, LITE edition for small businesses and academic users (professors teaching SPC / Six Sigma, executives preparing for Six Sigma Green Belt / Black belt examination, etc.). Both editions are economically priced, making them very affordable to corporate bodies as well as individuals. We have made a screen-shot demo presenting two highly enlightening Six Sigma projects (one from service sector and the other from manufacturing sector). This demo explains how our software could be used in such improvement initiatives. Software screenshots in each PowerPoint / PDF slide is accompanied by project narrative for easy understanding. A must-see presentation for anyone interested in process improvement ! Please click here to view a PowerPoint demo of the software. Kindly click here to view a PDF demo of the software. This software is priced very economically, making it affordable to all. Please click on the link LITE or STANDARD to visit our e-Shop just now to check the prices and/or to place an order. You can either make an instant payment online (Credit Card / PayPal / eCheck / Internet Banking) or generate a Proforma Invoice and make payment off-line (Bank Demand Draft / Check) within 30 days. In case of download version, you can download the software installation files from our website within six hours of making the payment. (Files compressed in WinZip format, takes just 3 minutes to download). Price of CD-ROM version is inclusive of shipping charges. Product CD shall reach you within 7 days (India) or within 15 days (other countries) of receiving the payment.